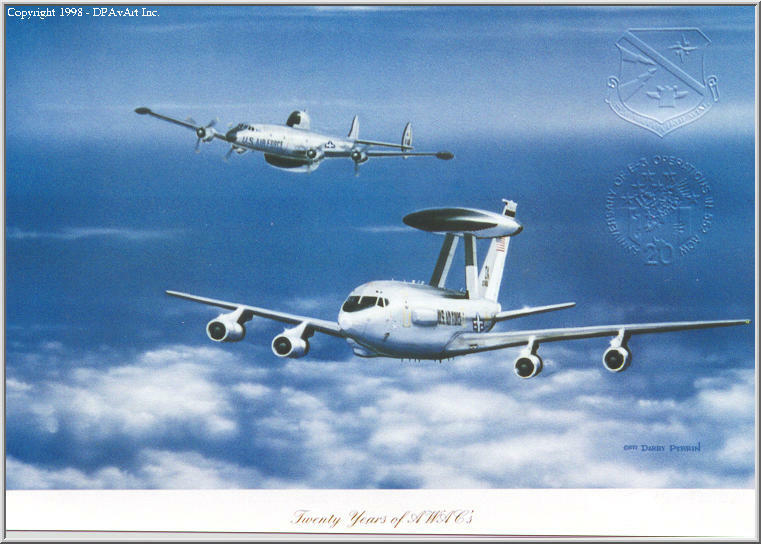 Everyone - I'm looking for input into what the AWACS 30th Anniversary print will look like. As I mentioned earlier I'd contacted Darby Perrin and asked him to work with AEWA on the 30th print. The 30th planning committee is aware that AEWA is commissioning a 30th print by Darby. Today I visited Darby at his new shop in the old Tinker BX building. He's got a great store and is proudly displaying most of his prints and paintings. Anyone in the Tinker area should stop by and check it out. He's there most days that he's not flying with the 507th ARW (aka Okies). Darby is going to send me some pictures of his shop that I'll post to the list and to the forums. 1. A print similar to the 20th (http://www.aewa.org/Prints/dp15.jpg) but with an E-3C (30/35) in foreground, an E-3A in the near background and a Connie (EC-121) in the distant back ground. Titled "Lineage" or something to that effect. 2. A print of a cocked E-3C (30/35) on the ramp, ready to go. Titled "Cocked and Ready" or "Sentry on Duty". There would be few background details to distract from the E-3. Come on post your ideas. Preferably to the AEWA Forums but if you email an idea into the AEWA list I will post it to the AEWA board in the 30th Anniversary Forum. I'm really anxious for the 30th; my wife and I enjoyed the 25th and have been looking for a good excuse to come back to OKC! JUST A THOUGHT ON THE 30TH ANNIVERSARY PRINT .....TO ADD A MORE HUMAN ELEMENT TO IT....MAYBE A SCENE SHOWING AN E-3B/C PARKED ON A DARK RAINY RAMP WITH CREWDOGS UNLOADING OFF A CREW BUS AND GOING UP THE STAIR TRUCK TO THE A/C DOOR DOING THE CLASSIC BAG DRAG WITH PUBS, BRIEFCASES, COFFEE JUGS, TAPE CASES (IF THEY STILL EXIST) ETC. IN THE SCENE'S FOREGROUND. IN THE BACKGROUND OF THE SCENE, A GHOST E-3A PARKED FURTHER DOWN THE RAMP WITH GHOST CREWDOGS DOING THE SAME KIND OF BAG DRAG ONTO THE GHOST E-3 WOULD MAKE FOR A NARLY COMMEMORATIVE PRINT WHICH BRIDGES THE AWACS FOLKS OF TODAY WITH THE AWACS FOLKS OF YESTERDAY. THE O'DARK- THIRTY BAG DRAG OUT TO THE A/C FOR ANOTHER LONG SORTIE IS A SCENE ALL AWACS FOLKS ARE FAMILIAR WITH AND CAN RELATE TO REGARDLESS OF RANK OR CREW POSITION. IT'S A SCENE THAT SWIMS STRONGLY THRU THE CURRENTS OF MY REFLECTION ON "THE AWACS YEARS" OF MY LIFE. Also a very good idea! I like the idea very much Don; my only concern is that it would be too busy. That aside, the concept is ideal and really signifies the life of an AWACer. We do need something different than the 20th print; there's no doubt about that. Another idea I'll throw out there besides my previous one: an E-3 flying over New York showing the towers burning. Something that signifies what's going on in the world now and since the 25th anniversary. Just a thought. I also like the idea of an E-3 on the ramp. I mentioned that to Darby when I picked up the sketches the other day. I sense a hesitation to do an on the ramp painting as his expertise lies with airborne scenes. Darby does paint some "sierra hotel" clouds but he not done many, if any, on the ground/ramp scenes. But who knows maybe this will be his first. Another idea I had of the 3 aircraft scene was a view of a E-3C (30/35) on station and an E-3A just departing with a Connie in the background showing the link between the Present and Past. Symbolizing station change overs from Connie to E-A to E-3C. I'm thrilled that there's traffic on this site discussing a subject (even if it's only the three of us)! So far, the ideas are all good and I don't envy whoever has to make the final decision. I agree with Don Summers. The E-3 is a beautiful aircraft. The systems work extremely well. But the AWACS we remember and celebrate is really the AIRCREWS we flew with and the maintenance and other support personnel that made our flying possible and safe. My wife, daughters, and I remember that day in March 1977 when we officially received our first E-3A. 30 years. Tempus Fugit. An early morning show on the ramp with a crew boarding and the maintenance guys prepping the aircraft. This may be difficult to do with regards to the personnel. Darby is an Aviation artist not a people artist. Getting the people in right would be difficult. Maybe an E-3, cocked and ready, in the early morning hours? I like the bag drag idea, we all have done it. Or the idea of station changeover. How many times have we done that. Could be a station changeover between two versions of aircraft.